We heard you loud and clear! Thank you for participating in our survey asking if we should stay with Canada Post or leave for the holidays. The response to switch, due to Canada Post’s ongoing backlog and delivery delays, was overwhelming. So, we are thrilled to announce that we will switch to an alternative Canadian partnership for the rest of the fourth quarter in an effort to improve transit times at this critical time of year. If you ship from the Ontario, Quebec or Atlantic region this service will be available in your postage options. This option will not be available to our BC and Alberta region clients. This new service will launch Thursday, December 6 for the remainder of the month. This new service uses a combination of established national courier partners (i.e. Apple Express, Canpar, FedEx). We’ve been testing this service for the past few weeks with fantastic results. If you already have some Canada Tracked Service shipments, you can still drop them off or simply re-do the postage label if you want to take advantage of this new service. *Estimated delivery days for Ontario region clients. 3-9 business days delivery for Quebec region clients and 3-10 business days delivery for Atlantic region clients. Note that for remote rural addresses, apartments and PO Boxes the delivery may still be handled by Canada Post. Feel free to ask any questions to our support team along with any feedback. Earn some extra money with Chit Chats. Chit Chats’ mission is to help Canadian entrepreneurs pursue their dreams and make shipping a little less painful. Being in Canada, we know how expensive shipping can be. We wanted to provide a Canadian shipping alternative that gives Canadian businesses another choice while helping them remain viable and competitive in the e-commerce world. 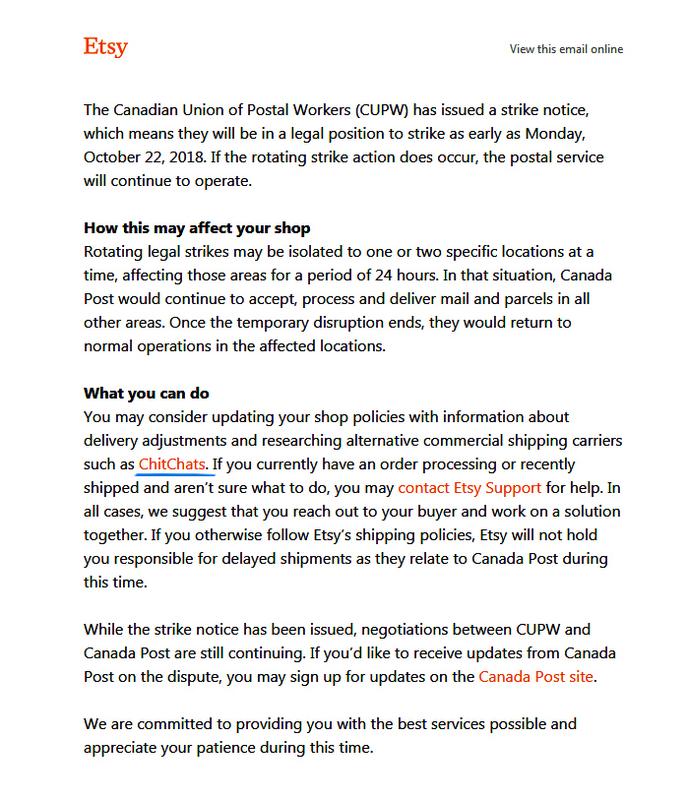 As Canada Post recently took action with rotating strikes, many online sellers have been looking for alternatives. Both eBay and Etsy provided some updates and showed us some love. We are thrilled to be considered a seller favourite! We know word of mouth is how so many of you found us today and our referral program is a great way to share Chit Chats with your friends. Plus, you’ll get to earn some extra money while sharing the love. According to Canada Post’s press release Canada Post will remain open for business, continuing to operate if the union decides to conduct rotating strikes across the country next week. Chit Chats will continue to monitor this closely as any disruptions planned by the union may impact our Chit Chats Canada Service as there would be delays with shipments using this service. 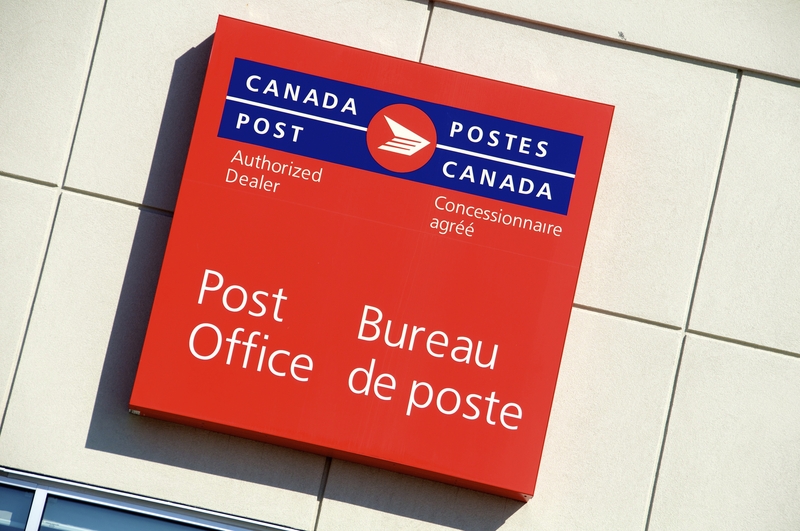 The possibility of a work stoppage has hovered over Canada Post since September 26 after postal workers voted overwhelmingly in late summer in support of a potential walkout to back their contract demands. Chit Chats has been an alternative to Canada Post during the labour disputes. Many Canadians have started shipping with Chit Chats as the threat of service being disrupted by the possible looming strike continues. Chit Chats has been recently featured in both Canadian Business and Chatelaine publications. Canadian Business writes, “Canada Post doubts have spelled opportunity for its competitors. Canada Post has lost 75% of its parcel delivery business as labour disputes drag on.” Read the full article here. A Canada Post strike or lockout would disrupt hundreds of thousands of small businesses, but there are other ways to communicate. Chit Chats offer alternatives to Canada Post as the potential strike or lockout would disrupt hundreds of thousands of small businesses. Read the full article here. In July 2016 , Chit Chats was also featured on Chatelaine.com as a shipping alternative to Canada Post during the postal disruption. Even with the Canada Post disruption long over, Canadian online merchants are still joining the Chit Chats revolution in search of lower shipping fees and speeding up delivery of their Canadian products to domestic and international customers. Save up to 70% on shipping to the U.S. with Chit Chats which includes tracking and faster delivery at a fraction of the cost compared to Canada Post. Chit Chats helps Canadian e-commerce businesses compete on a level playing field in the global economy. 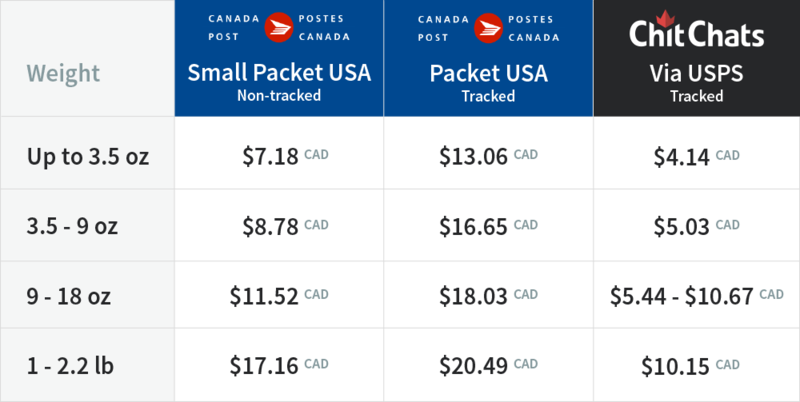 Canada Post has quietly ended low cost eCommerce shipping options. As of January 15, 2018, Canada Post discontinued their Light Packet USA services and at the same time, will phase out the use of stamps on the Small Packet USA packages. This will definitely impact many Canadian eCommerce businesses who ship regularly to the US. Every year, carriers increase their rates — this year Canada Post not only announced its annual rate increase which took into effect January 15, 2018 but also made some ‘small’ changes. It’s important to point out that these ‘small’ changes in fact will have a ‘big’ impact for many businesses. 1. Canada Post changed its dimensional weight factor from 6,000 to 5,000. A parcel that would have been considered at a dimensional rate of 4.5 kgs is now considered at a dimensional rate of 5.4 kgs which will not only include the annual increase but the higher dimensional rate factor. That’s an increase of 5.6%! Tip: Package your item as compact as you can to minimize dimensional weight charges. 2. Canada Post discontinued Light Packet USA service. Canadian online businesses relied heavily on the use of Light Packet USA as it was a low cost shipping option which helped compete with American competitors. Chit Chats offers USPS postage to clients so that they can compete and unlike Canada Post, USPS offers low cost tracked shipping options. 3. Canada Post will phase out the use of stamps on Small Packet USA. Online sellers like eBay, ship small packages to the US by purchasing stamps in bulk online at a big discount. Canada Post will phase out the ability to use stamps on Small Packet USA packages. This will mean that Canadian sellers will have to raise their shipping costs which will make it difficult to remain competitive. By offering USPS rates to Canadian businesses, Chit Chats provides a solution and an alternative to Canada Post and their recent changes. Learn more about how Chit Chats can save you up to 70% when shipping to the US. Chit Chats does utilize Canada Post for shipments destined within Canada and the team is working on offering a solution should Canada Post go on strike. Updates on alternatives will be provided as soon as details are confirmed as we have received many inquiries from businesses who are worried about how this will impact them. Taking all of this into account, we believe that the threat of a potential labour disruption is quite low. Because of this, as well as listening to feedback from our clients, we will resume using Canada Post for our Canadian shipping. Effective Wednesday, July 13th, 2016, Chit Chats will be accepting packages via Canada Post and regular services and rates will apply. As of tomorrow, there will be no need to complete the online ‘ship Canada’ form. Please visit our website for more details on Canadian shipping. Rest assured that we will continue to assess the situation with Canada Post and CUPW. While Canada Post has been hoping to avoid the potential July 2nd lock out/strike, it isn’t looking good. An enterprising family-run Canadian business has been taking a hands on approach to helping Canadian e-tailers sidestep Canada Post and provide lower-cost shipping to the U.S. For the past 15 years, Chit Chats has been quietly driving Canadian customers’ parcels across the border 6 days a week. Their destination? The United States Postal Service. 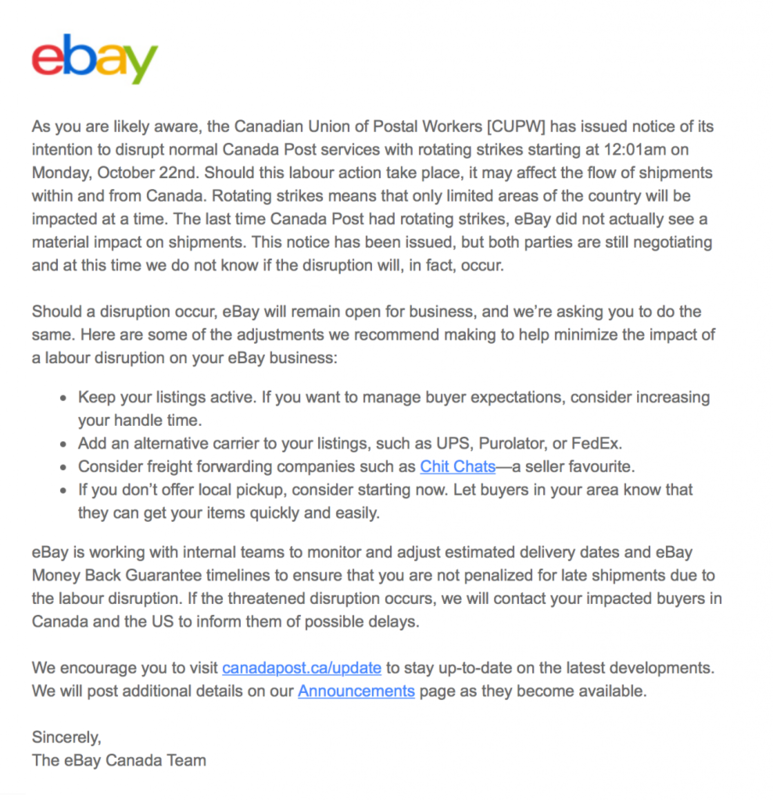 With online sales reaching new highs, a Canada Post strike/lockout will have a major impact on Canadian e-tailers as they cannot afford to suspend shipping. While companies like FedEx and Purolator may come to mind as options, they typically also come with a hefty price tag, which would leave many small businesses in the red. Canadian businesses are now on a quest to find a reliable, economical alternative to Canada Post. President of Chit Chats, Carly Wood talks about how their company has evolved from one rickety green Suzuki station wagon, to a full service shipping company with 6 locations, Canada-wide. “We ran a bookstore back then (2001) and we just could not afford the cross-border postage costs, so out of necessity my Dad started driving to the U.S. to drop off mail,” Wood says. Word soon spread and the family’s station wagon was overflowing with parcels from a range of local businesses. “We quickly evolved; got a fleet of cube vans to expedite deliveries and began focusing solely on helping Canadian e-tailers and small businesses save money, hassle and time on U.S. deliveries,” says Wood. “The success of Chit Chats is a testament to her late Father, Derek Nolan’s enthusiasm for helping e-commerce businesses succeed and his straightforward and cheerful spirit,” she says. As a result, Chit Chats has helped Canadian e-tailers circumvent bureaucracy and benefit from shorter cross-border delivery times and tax & duty-free shipping. Most compelling of all, customers like eBay based Retro Heads and electronics retailer Alectron save an average of 70% on shipping, compared to traditional Canada Post business rates. “It is hard for Canadian retailers to compete against US-based e-stores who benefit from lower U.S. Postal Service costs and faster shipping times,” explains Wood. “Chit Chats helps level the playing field so Canadian e-tailers can fight the status quo and ship to the U.S. more easily and at a much lower cost. We’ve become a one-stop cross-border shipping shop because of our commitment to cutting the bureaucracy, hassle and costs that make it hard for Canadian e-tailers to succeed in the U.S.,” she says. It is clear, another strike or lockout by Canada Post will have a negative impact on Canadian businesses. Fortunately, there are alternatives out there and perhaps a silver lining. As Canadian online retailers investigate ways to avoid delivery delays in the event of a strike, what they might end up discovering is a reliable, cost-effective alternative to Canada Post that is in it for the long haul. Chit Chats is a 100% Canadian owned & operated company, with locations in B.C., Ontario, Quebec and the Atlantic region. Since 2001, Chit Chats has been helping Canadian businesses and e-tailers reduce their shipping costs and improve service to the U.S. and abroad. Chit Chats drivers make delivery runs across the border six days a week saving Canadian businesses an average of 70% on shipping costs, compared to Canada Post business rates. Learn more about Chit Chats today and how you can save big on shipping to the U.S. and wordlwide.